This Week’s Writing Links feature some clever logo branding for the Milwaukee Public Library’s new ad campaign, 10 common mistakes writers make at conferences, 10 legendary bad boys of literature and a video of soccer prodigy Lionel Messi when he was being an amazing (and classy) 10-year-old, because why not? I’m always happy to support a library branch, especially while our own city branches weather some harsh budget cuts. 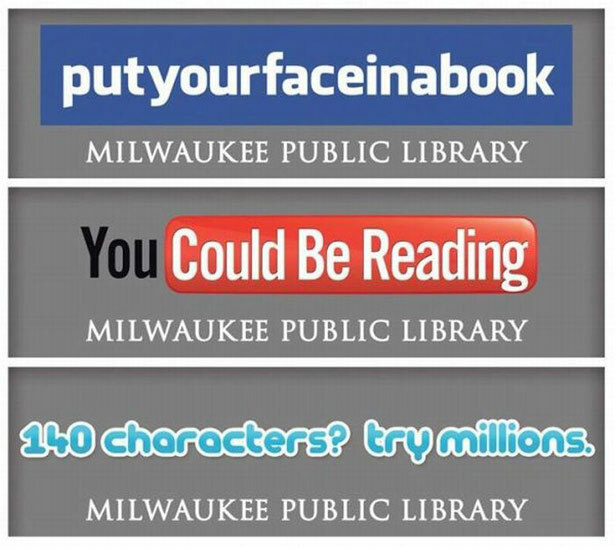 Although Milwaukee is certainly utilizing a clever approach with their campaign, you have to wonder if using popular social media branding may ultimately just remind kids that they need to check twitter. Here’s to hoping that’s not the case. Also, SF Signal, a site I’m a big fan of, just underwent a design update, so make sure to stop by and check it out. In other news, links. This entry was tagged Conor Dempsey, Free Pizza, Kurt Russell Hair Products, Milwaukee Public Library, RJ MacReady, Sf Signal, The Exiles of the New World, Writing Links.